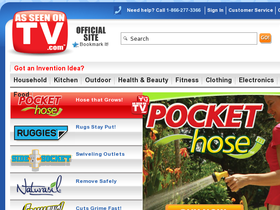 As Seen on TV, online at AsSeenonTV.com, is your destination for products and merchandise publicized on television. As Seen on TV sells household products including door anchors, Monster 1200 Cleaning Machines, Go Dusters, Snuggie, and Side Sleepers. As Seen on TV also carries pet hammocks, Doggy Steps, Grill Daddy, Bug Zapper, hot dog toasters, soft serve ice cream makers, and gravy warmers. Yogurt makers, wireless alarms, cell phone clip hangers, and shaving pads can also be found at As Seen on TV. RetailSteal.com has the best As Seen on TV coupons, As Seen on TV discounts, As Seen on TV coupon codes, and As Seen on TV promo codes. Shipping and handling rates at As Seen on TV depend on the pricing of your purchase and your shipping destination. Orders are shipped via USPS and UPS Mail Innovations. See website for full details, exclusions may apply. Check out the As Seen On TV store and save up to 50% off a wide variety of As Seen On TV products including Pajama Jeans, Style Snaps, The Shake Weight, Chef Basket, and so much more. Get $5 off your next order when you sign up to receive email updates when shopping online at AsSeenOnTV.com. Click to save. Buy Easy Feet for only $9.99 when shopping online at AsSeenOnTV.com. Click to save. Get the Fast Brite Lens Restorer for only $9.99 when shopping online on AsSeenOnTV.com. Click to save. Get pajama jeans for only $39.95 when shopping online at AsSeenOnTV.com. Click to save. Save with the Deal of the Day when you shop online at As Seen on TV. Click link for savings.